In today's business environment, work get's done through projects. Your ability to successfully manage a project is critical for your success. The purpose of this website is to help you improve your project management skills. Understanding project management principles can help you excel in each of these areas. To effectively manage a project you will need to develop your abilities beyond what are considered typical project management skills. Skills for Managing Projects: This includes your typical PM skills such as schedule management and scope management. Project management skills consist of the combined skills from these three areas. Developing your skills in project management can accelerate the achievement of your professional goals. 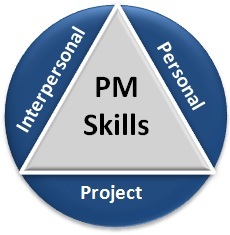 If you take the time to improve your PM skills, you WILL stand out from your peers! It's not a matter of IF you will be called on to manage and lead a project. It's a matter of WHEN. Will you be ready when the opportunity to manage a project arrives? Michael is passionate about project management. He has been living a "Project Life" for more than a decade, learning and experiencing as much as possible about project management along the way. You can find out more about him on the About page.